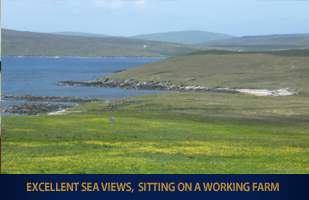 Aesthus was built in the 1970's and has been recently refurbished, providing homely, comfortable accommodation with modern facilities. Sole use of the garden provided - suitable for children. 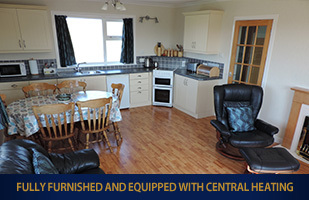 It is fully furnished and equipped with bedding, sheets, towels crockery and cutlery. There is a fridge, freezer, washing machine, tumble dryer and microwave. Other drying facilities in the garden and airing cupboard in the hallway. Heating is by oil-fuelled central heating which also provides hot water - the charge for this is included in the rent. There is an electric fire in the living room. Open Plan Living Room/Dining/Kitchen: Cooking on electric cooker with electric hob with oven and grill. Three Bedrooms: 2 twin rooms upstairs. Cot available. 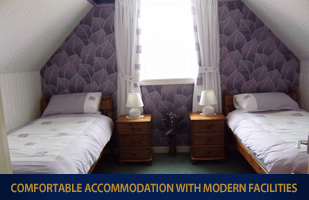 1 double room with ensuite shower, toilet and wash basin on ground floor. 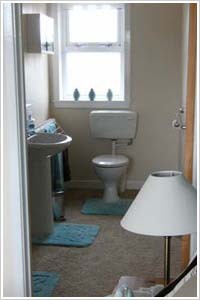 Bathroom: Bath, toilet, wash basin, and bidet (on the ground floor). Free Wi-Fi is available. Some mobile networks do not get a signal in the house. A colour TV with Freeview and DVD. There is a plentiful supply of books for all ages. Electricity charges are calculated when you leave. The meter will be read on arrival and departure. June/July/August - £450 Per Week. May/September/October - £390 Per Week. Long-term winter lets are also available.